Trump/Pence regime means a reign of TERROR on top of 400 years of hell for Black people! The Revolutionary Communist Party has a plan to STOP this! Trump/Pence regime means a reign of TERROR on top of 400 years of hell for Black people! The Revolutionary Communist Party has a plan to STOP this! 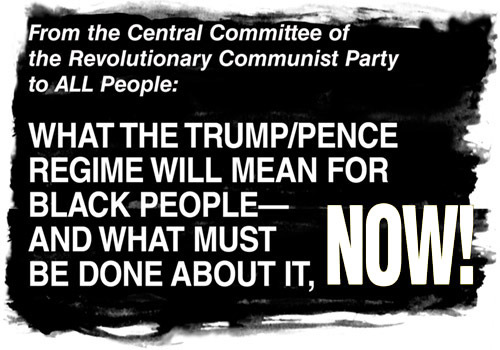 In response, the Central Committee of the RCP has issued a statement that is being distributed in the 10s of thousands especially on the south and west sides of Chicago; the Revolution Club is opening an organizing center in South Shore with another office to open soon on the west side; Carl Dix*, a founding member of the RCP, has come to Chicago as a spokesperson for the RCP’s plan. Bob Avakian of the RCP, the leader of the revolution, has charted a different plan: REVOLUTION. 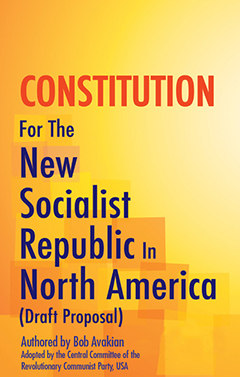 We have the leadership and strategy to see this through to victory and a blueprint for a new society, the Constitution for the New Socialist Republic in North America. The launch of the center in South Shore, 1857 E. 71st St., will be held on Sunday, February 26th at 3 pm. The community is invited. For the press, Carl Dix is available for interviews. This center will be a place where those who are tired of seeing young Black people killed by other young people, who hate the way police unleash terror in our neighborhoods, who want to drive out the Trump-Pence regime and to see an end to all the horrors of this system can get connected with a plan and an organization that’s about doing all that. * Carl Dix is a representative of the RCP. In 1970 he was part of the Fort Lewis 6, the largest mass refusal by US soldiers of orders to go to Vietnam, and he has spent decades struggling to end the exploitation and oppression this system enforces on humanity.